Thanks for installing the game! Here is some info to get up and running. For the latest news and info visit the TLM Page at rtsoft.com. To see what's new in this version, click here. 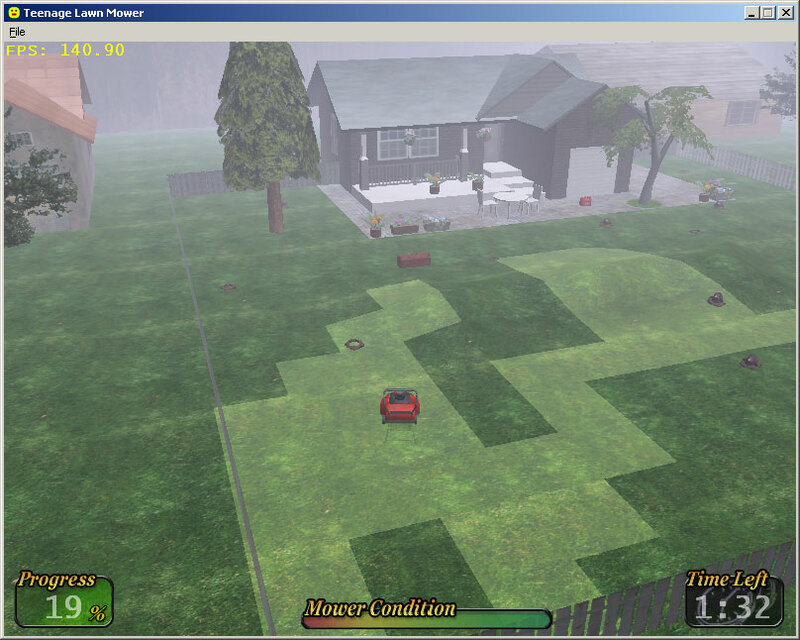 Arrow keys Lawn mower control. V Power turn - Hold down WHILE turning and you will turn much sharper. If your keyboard doesn't register the V key while arrow keys are already being pressed you may need to move power turn to another key. (some laptops need this) Note: This is KEY to controlling the mower, get used to using this! It's the only way to play! S Start/stop your lawn mower. No real reason to do it but hey, it's fun. TAB Toggles between different views. On some levels you may wish to choose the "far away" view to see rocks and things coming better. F2 Shortcut to change resolutions. This is also available on the options menu. Escape This usually brings up a menu anywhere in the game. Sometimes during a story sequence hitting escape will do nothing, in this case finish the sequence and try again later. This will toggle the framerate display. Enter During 3D gameplay mode will activate the Weed Killer item. L Toggles locking the camera. Feels like you're driving an RC car when you do that. Whee. Gamepad is fully supported. Buttons are preconfigured for Microsoft Sidewinder style gamepads. If multiple gamepads are plugged in, all will be functional. Note: Buttons 7 and 8 (the triggers on the side/underneath on most gamepads) function as "Power Turn". Other buttons will change camera view and activate the weed killer item. Gamepad controls are not reconfigurable like the keyboard ones. During conversations the following keyboard equivalents can be used instead of the mouse. Pageup/Pagedown Scroll text up and down. Only functional if you see the blinking scroll indicators. During your mowing adventures there are many items that can be picked up. Here are a few of them, the rest you'll have to experiment with. It's odd, but a lot of people leave cans of nitro-gas laying around their property to help you out. These provide you with a temporary boost of speed. Don't waste it! Tools repair 50% mower damage. Be careful not to touch it until you need it. Weed killer is hard to find but a value tool to add to your arsonel. Turns out weed killer also kills grass, use it to quickly tame a large area. Each item provides one use. You can store up to seven at once and take them to other lawns to use later. If you find cash laying around, why not help yourself to it? Even if you fail to finish the job you get to keep whatever you find. If you are having problems running TLM the first thing to check is to make sure you have the latest drivers for your video card the latest version of DirectX installed. If you get this message, it means you do not have a recent version of Directx installed. New games need this! You can grab and install the latest version from here. TLM requires a 600mhz speed processer or better and a 16 meg+ 3d graphics card. A trick to getting more speed out of the game is hitting F2 after a level starts and choose a lower resolution or bit depth for gameplay. First and most important: Install the LATEST version of Directx and also the latest version of your video card drivers!!! This will fix 98% of the problems, no joke. If you run the game like this: "mow.exe -debug" it will spit out a debug.txt file. Check the debug.txt and the errors.txt file for clues. If you would like to try the game with no sound to isolate the problem, run with the parm "-nosound". You can also use "-nojoy" to disable the joystick support. If all else fails, email those files with a description of the problem as well as your system specs (computer brand, memory and computer speed as well as video card model) to support@rtsoft.com and we'll do our best to help ya out and fix the problem! Ok, you should able to easily see the mowed areas are a much lighter green like this. If not, you need to update the driver on your graphics card. If it's an NVIDIA card (Geforce, etc), go here. © 2003-2007 - Robinson Technologies. All rights reserved.